i've been in the ring of the priesthood for the past year now, and the left hook that i didn't see coming was none other than Mr. Administration. Pow! Bang! Snap! what the? seriously, where did that come from? it feels i'm always in the office trying to return calls, email, etc. i'm always behind, trying to catch up. i must admit that i did not expect this, and that it has taken me longer to find that much desired balance. 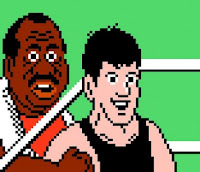 oh well, at least i got to use a cool pic of NES Punch-Out, coupling it with this techno song. tonight, as mc, i was helping with Paul's ordination rehearsal, at Assumption of the Blessed Virgin Mary. he'll be ordained a permanent deacon on Saturday. things went well, and i'm looking forward to the celebration. after a year of priesthood i'm picking up a few tips and tricks. administration may not be very far, but i'm managing to manage it - somewhat. more on reflections on my year thus far, but let's begin by saying that it was a rollercoaster of a ride. good times! we are entering the last week of the Year for Priests. this year has been about the interior renewal of the priesthood, and of the priest. let's pray for our priests, that they may continue to purify their calls, so that they may be the salt of the earth, and light of the world. briefly, the week that was, à la Michael Coren, the March for Life a, and b, my brother Hezuk's ordination to transitional deaconate, Montée Jeunesse went extremely well - here are a few pics 1) ABp Prendergast: a on the Eucharistic Process, b, 2) the Anglo-Catholic also on the Eucharistic Procession. ok, more than a week is featured here, and more has happened since. however, it gives you and idea that Mr. Administration hasn't won afterall! another jammed pack two weeks, then i'm off to Qc and NB! peace.